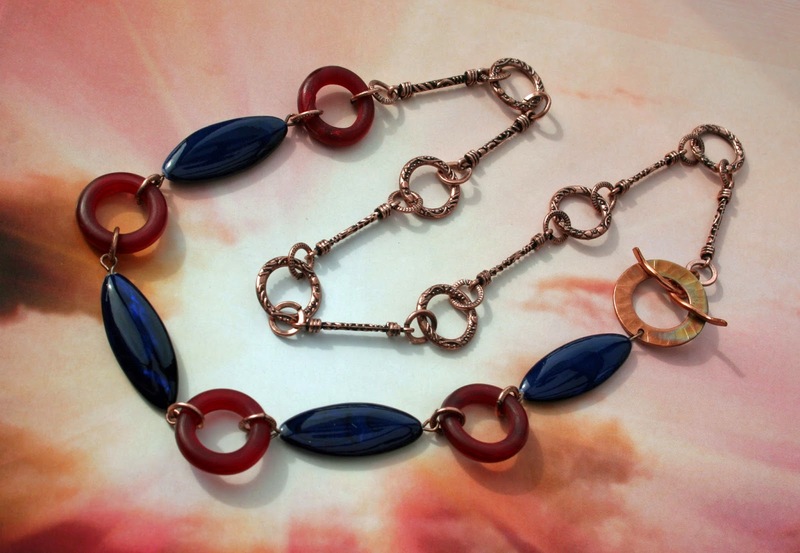 It´s time to introduce my jewellery of the international Bead Soup Blog Party. The one organizing this project once again, is amazing Lori Anderson. Nearly 500 people all over the world are involved this party! 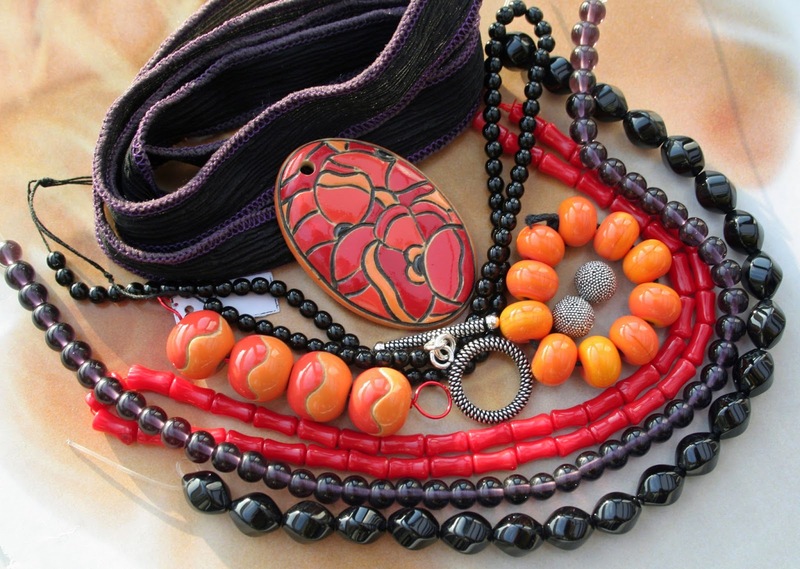 You can see more of this huge bead swap in her pages and a list of participants here. I'm taking part of the Party for the second time. Last year my partner was lovely Sandra from Germany. I was so sad when my blog pages disappeared, but I tried to collect it somehow again here. When our kids were small (about twenty years ago...) we travelled a lot with our traveller car around the Europe. This soup carried me to the past, to the beautiful memories of our summer holiday journeys to the southern Europe. I loved the Provence and the colors of it. When I saw the colorful bag Karin sent to me I even felt the lovely aromas of that memorable area. It´s truly one the most delightful places on the Earth. The pendant Karin sent to me, is the unique ceramic pendant made by Tracee Dock. 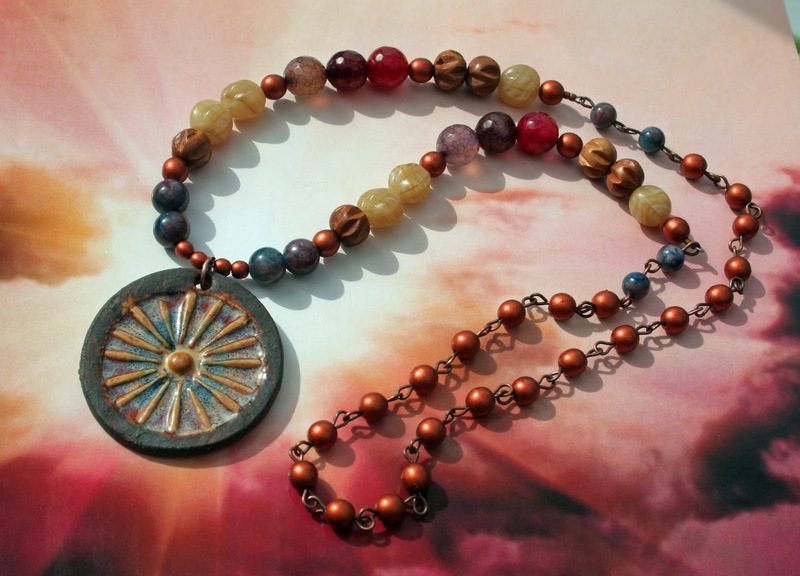 The beads I took from her soup for this necklace, are copper colored Czech glass beads in different sizes and shapes, sandalwood beads and some colour painted agate beads. Only a few blue mashan jade beads are my own. The necklace is so long that it´s without the clasp. Next I took the hand painted copper clasp Karin sent to me. It would have been perfect with the pendant, but the long necklace didn´t need it necessarily. So I took the red horn rings and the painted blue mother of pearl beads with my own copper chain (which I changed a little). Very simple, but I think it works. I hadn´t use any ribbons yet. 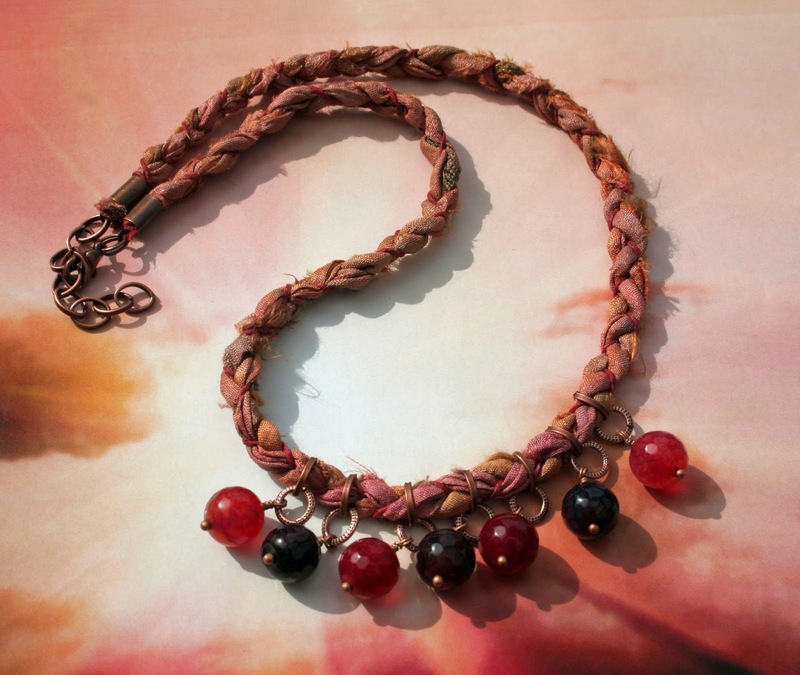 I made a plait to the short necklace by using the recycled sari silk and the red waxed linen and added some agate beads. Almost everything is still from Karin´s soup. Only the copper parts are my own. Then I was going to stop, but there were still some beads left, so I made one necklace more. :) I have made some little changes after taking this picture, but not very big ones. 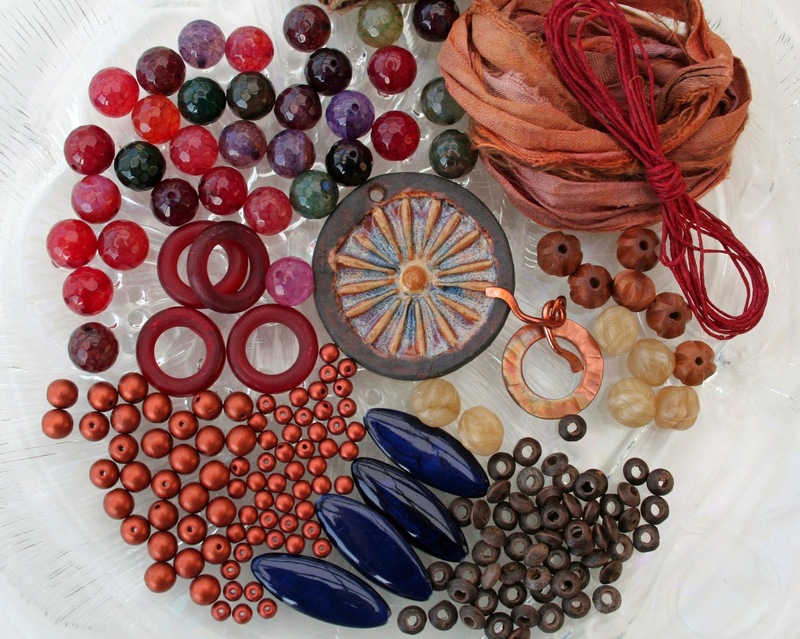 Here you can see more Karin´s agate beads, the rest of the Czech glass beads and the waxed linen cord. The copper is mine, as well as the bronze leaf, the Czech crystal bead, and the two handmade beads by MiunMaun, my Finnish skilled `bead friend´. The way I made the chain by using the waxed cord and the small Czech beads is `something new´ for me. Everything else is very familiar. Thank you Karin for the lovely soup. You gave me more than the beads; you gave me a ride to warm memories. :) And thank you Lori for this wonderful opportunity to take part in this enormous Party! I have now so busy time in my life, that I´m afraid I don´t have time to visit many of the blogs very soon, but I promise to do it later. Kärrynpyörä, kertakaikkisen ihana värikimara! Hienosti käytetty ihana helmisatsi! Ihania helmiä ja kauniita korujahan niistä kehkeytyi. Herkullisia väri- ja materiaaliyhdistelmiä! This is absolutely gorgeous, I love how you make so wonderful "simple" jewelry. I'm happy you could travel back in time with the beads. I loved our partnership and you sent the most beautiful soup to play with. Thank you so much! 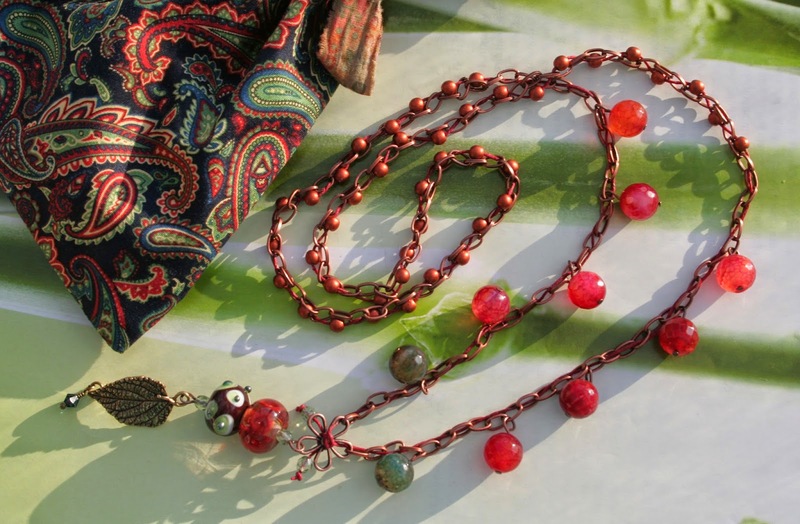 Beautiful jewellery, i love the plaited sari silk necklace its really gorgeous. Merja, I absolutely love your simple jewellery. In fact, I've been following your blog for a while. There are several pieces I find favourite: the blackberries necklace (I love the the way you've attached the dangles) and the colours of Provence necklace as well (the intertwining of string and beads with the chain is great). Ihania koruja, Suntsa! Ensimmäisenä ihastuttavat nuo vahvat ja persoonallisesti yhdistellyt värit. Lisäksi koruissa on vahva yhtenäinen tyyli, ne voisi kaikki ripustaa päälleen yhtaikaa. Kärrynpyörä on aivan mahtava ja letitetty nauha mainio idea. Hyvä tyttö! Lovely designs - great colour matching and I love that first necklace in particular. Jos nää on simppeleitä, niin simppeli on kaunista! Tuo Karhunvatukka on kertakaikkisen herrrrkullinen, rakastuin siihen täysin. I love what you did!! Your English is terrific and that Cartwheel necklace is stunning!! well DONE!! great projects, especially this necklace with sari ribbon! excellent! So, so beautiful. I love your eye for color. That's a lovely idea, the plaited necklace! And I love the use of colours in the french rings necklace. Nice soup, Merja! All of your pieces turned our great but that first one with the ceramic focal is my fav. Lovely. 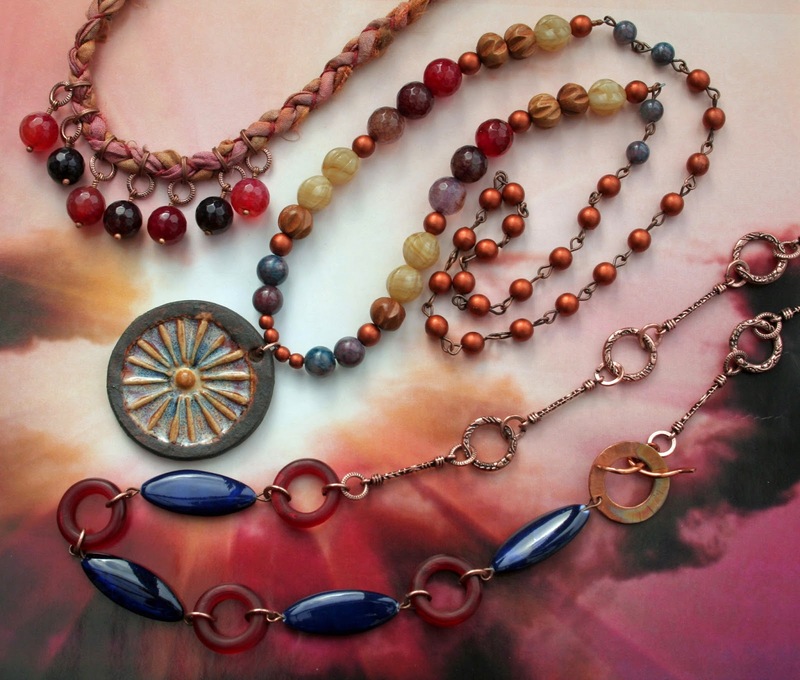 I love the idea of the plaited necklace, and the necklace with the ceramic focal is a stunner. Those are all so lovely! The plaited silk in particular is gorgeous. WOW! *STUNNING* My fav is the first piece - just so gorgeous! I actually pulled some agate out last night and was completely uninspired - thank you for the reminding me of their beauty! Hi Merja, You showcased the focal well in your first necklace. "French Rings" is my favorite. It is designed well. Plaiting the ribbon was a good idea. I like the dangles you made for it. Kudos to you for knotting the waxed cord. Wonderful necklaces. The designs are elegant and all very wearable. Great work with your soup. I've never been to Provence but now I can sense the "flavor" of the area through your sense of color and design. Such pretty things you made, it must be beautiful country. Love the French rings necklace. The blue painted mother of pearl beads are wonderful! Your designs are truly lovely. I especially like the "French Rings" necklace. Everything looks great. Nice job! Your soup ingredients was so pretty and you made such lovely pieces! Very elegant and stylish work!♥ made with lovely colours and playful techniques. Love the ♥Provence necklace♥ in particular! Lovely pieces! You did a great job with your soup. These are stunning! So wearable! Love the color plate you got to work with! Really Soup-perb! Gorgeous colors and each piece is absolutely gorgeous! Great job! You may think you made some simple pieces, but I think they are so much more. They are really fantastic. Beautiful! I especially love that last necklace. I love that your soup was able to bring fond memories with it and create new ones as well! Beautifully done! I love every single piece! The colors, the wired links and the use of fiber and thread make them so special! My favorites are the first and the last necklace!